Wimer Bridge: It was the only Jackson County covered bridge open to vehicle traffic, but collapsed due to traffic in July 2003. 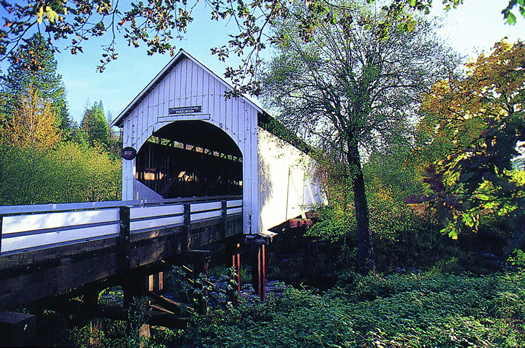 On a hot summer afternoon, in the quiet community of Wimer, Oregon, local residents were startled to hear a giant crashing sound coming from the vicinity of their covered bridge. Customers at the Wimer Market, only a dozen paces away, rushed out to witness the unthinkable. The historic Wimer Covered Bridge in Southern Oregon had spontaneously collapsed into Evans Creek. Those who were the closest also heard shouts for help coming from inside the rubble and scampered down the bank, over the shattered shingled roof and lifted broken wooden beams to rescue a man and his two young grandsons. They were the last persons to stroll through the old covered bridge on that fateful Sunday. Ironically, the covered bridge was scheduled for a major overhaul. Engineers had completed blue prints just two months earlier and the construction project was to go out for bid in September that year. Jackson County had acquired grants for over a half million dollars for the renovation that was due to begin in 2004. But the tired old structure couldn’t wait and gave way in mid stream. Obviously, there has been a change in plans. The original Wimer Covered Bridge was built in 1892 by J. W. Osbourne but, in 1927, was totally replaced by Jason Hartman, then Jackson County bridge superintendent. Over the years the Evans Creek crossing received numerous repairs, but time and use took its toll on the aging span. In 1962 attentive residents saved the bridge from destruction when a citizens effort rebuilt the weakening structure. Load limits were set at 3 tons with no heavy truck traffic allowed. 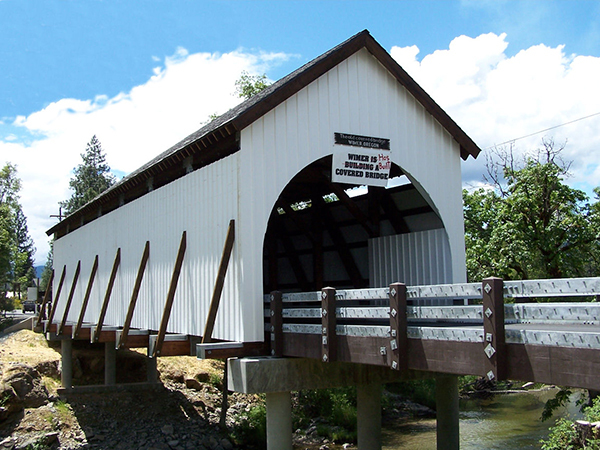 On April 6, 2004 over 120 people from Wimer, Evans Valley and throughout Southern Oregon, gathered in the Rogue River High School gymnasium to initiate plans to rebuild the Wimer Covered Bridge. A half dozen Jackson County officials and engineers presented the Wimer Covered Bridge Feasibility Study which included architectural drawings, financial analyses, and six alternatives for replacement. Eighty-three percent of attendees at the public meeting voted to replace the original wooden truss covered bridge. For that choice, the financial analysis broke down like this: Initial Project Cost, $887,000. Current federal funds from the National Historic Covered Bridge Presentation Program, $407,000. Current Budgeted County Funding, $146,000. That leaves additional funding required for the initial project in the amount of $334,000. If the community is to have a new bridge just like the old one, it needs to pitch in with fund raising projects. The Citizens for Rebuilding the Wimer Covered Bridge, now a tax-exempt, nonprofit organization, is dedicated and wants to recapture history. It took a year for the community to shake off the shock of loosing its beloved old bridge, but now a revised Citizens committee has a mission and a goal. It is determined to build a new covered bridge, a replica of the old one. In a letter to the committee, a Jackson County Commissioner outlined what the community needs to do before the County can secure the federal portion of the funds for a new covered bridge: Either the community comes up with a fundraising Plan to raise the extra money, or the County will proceed with their own plan to build the least expensive bridge. “That sounds like the County wants to build a boring old concrete bridge,” complained a Citizens committee member. “We're not going to let them do that.” Headed by new Chairman Dan Roberts, a new board of directors and dozens of volunteers, the Committee has outlined a Master Plan of fundraising activities to raise its portion of the needed funds. The bottom line is the community needs to raise $334,000 if it wants another wooden covered bridge, and already that amount has been reduced. But the local community has a basic financial challenge. Half the residences, from Rogue River to Wimer, are made up of low-income households and the elderly. Additional funds can’t come from local sources alone, they need to be raised from the outside, from grants, from public and private donations and from covered bridge buffs all over the nation who also want to see the bridge replaced. In the past, history buffs, tourists and motorists of all stripes took the path less traveled and drove out to the rural reaches of Evans Valley to see the old covered bridge. Out-of-town visitors to the area created their own tradition and purposely went the extra mile just to drive through the bridge once more before returning home. With a new covered bridge in place, locals and visitors will, as they have done before, stop to take pictures, enjoy bar-b-cue at the Wimer Market, relax in Mae Ellis Park below the span, maybe pick wild blackberries along the creek, wade in the cool water, and reminisce about their personal attachment to the area. In time the community of Wimer will, with a little help, have another covered bridge as its centerpiece. Their best assets are those among them who have a vision for the future. They know how it can be again. HOW TO GET THERE: 7 miles northeast of Rogue River on East Evans Creek Road (turn right on Covered Bridge Road in community of Wimer). Thanks to Yahoo Maps for providing a great way to find your way!